On impact, the Signfix frangible pole is designed to tear and break away at the sleeve top and in some instances, could deflect into the carriageway. The pole restraint device will secure the base of the pole close to the sleeve top after the pole has separated from the sleeve, rather like an ankle tap. The restraint device is made from a heavy-duty bracket, clamped to the pole 100mm above the sleeve top. Heavy duty galvanised chain is attached to the bracket and connects the lower locking bolt located at the sleeve top. The chain length can vary depending on the pole diameter. The chain will be approximately 500mm long to allow sufficient length for the pole to break free from the sleeve before being pulled to the ground, allowing the vehicle to pass safely over. To ensure the breakaway process remains consistent a 10mm hole must be drilled on site through the pole 15mm above the sleeve top, with the locking bolts facing oncoming traffic. The hole needs the provided plug to be used to reduce water ingress. 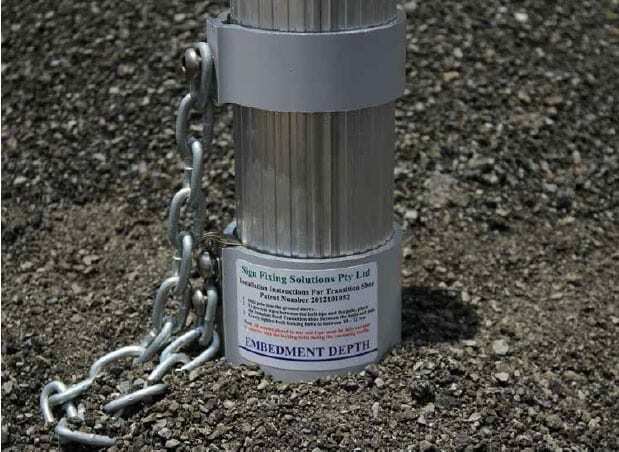 The restraint device fits within the pole bracket attached to the pole before securing the pole in the sleeve. Trilobular locking bolts must be tightened from 10 – 12 Nm. To further reduce damage or injury, Signfix recommends the device is fitted to all Signfix frangible poles, particularly in high pedestrian and traffic areas.